This post will walk you through the steps necessary to add a strongly typed appsettings.json configuration file to your console application. I’ll dispense with the formalities of writing a detailed introduction on why you would be interested in doing this and jump right into the steps involved. Note: This post assumes .NET Core 2.1, but I believe any 2.x version will work. 2. Right-click your console application, and select “Unload project“. Once the project has been unloaded, right click the project and select “Edit <your_console_project_name>.csproj“. 5. Right-click your console application and select the “Reload project” option. dotnet user-secrets set MySecret "MySecretValue"
7. Create a new JSON configuration file for your console application and name it appsettings.json. Set the following to the contents of the file to the JSON below. Important: Be sure to right-click this file and select properties. Change the “Copy to Output Directory” option to “Copy if newer”. If your console shows your settings correctly, congratulations! If you’re missing the AccountName and ConnectionString settings, be sure you followed the step to “Copy to Output Directory” listed in step 7. NDC Minnesota is the inaugural NDC Conference event for the United States. I’ve long followed the event online as they post most of their conference sessions on Vimeo. The event was held in the very well appointed St. Paul RiverCentre in downtown St. Paul, MN. Absolutely no complaints about the venue, the event itself, or any of the speaker presentations. I honestly was expecting a number of hang-ups since the first year for a conference is usually a learning experience but it feels as though the NDC team is really on top of everything given their past events at other locations. I attended a number of really great sessions. Some of my favorites were Steve Sanderson talking about Blazor, the new experimental WebAssembly transpiler, Scott Allen discussing his opinionated approach to .NET Core development, and Nik Molnar talking about progressive web apps (PWAs). On top of my favorites there were other really wonderful sessions on AWS Lambda, Azure Functions, React + TypeScript, Docker, Azure Data Lake, and Webpack. All of the speakers were well prepared, well rehearsed, and there were no technical issues in any of the talks I attended. It was a great way to process a lot of information in a very short period of time. I always leave a developer conference feeling inspired. NDC Minnesota was no different. During the sessions I’m usually furiously pounding notes away on OneNote and I have a laundry list of topics I’d like to spend more time learning in the near future. Most of my current weaknesses are on the client, centered around TypeScript, Unit Testing, and React. I’d really like to spend more time on those technologies in the near future and NDC Minnesota provided a lot of really great material to help point me in the right direction to improve those before the year is out. Front-end frameworks like React, Angular, and Vue are making big waves in software development. Microsoft makes great tooling for working with JS frameworks like those in the form of Visual Studio Code. There is also a large trove of information and tutorials getting setup inside the VS Code environment. One specific resource I really appreciated was Cory House’s Pluralsight course on setting up a JS development environment. Unfortunately, at least in my experience, there isn’t much available out there on how to setup a React dev environment using Visual Studio 2017, for those of us who wish to use only a single editor to maintain our .NET applications. My hope is, that the rest of this guide will serve as a useful resource for anyone else who is facing this same impediment to getting started and will end up saving them time. Visual Studio tries to take care of a number of things for you when dealing with npm pacakges. Some people prefer this, other’s don’t. I fall into the latter camp. It took me a bit of headache to figure this out, but by default, when you save a packages.config file, Visual Studio attempts to run ‘npm update’ for you automatically when you save the file or open the solution. So, if you are trying to run the command yourself after updating packages.config, then you are going to run into file locks with the /node_modules/ folder. Thankfully Visual Studio offers you a way to disable the automatic updates when saving packages.config. Navigate to Tools > Options, then to Projects and Solutions > Web Package Management > Package Restore and set the following settings for NPM (below). What this does is prevents npm from being executed every time you open a project, or run a command line ‘npm update’/’npm install’. You can leave these on if you wish, but for me I found the experience better by being able to execute the npm command line syntax myself. Instead of walking you through line by line of each step you need to follow, please download the sample application from Github. There are a few important areas that I think are worth mentioning. If you changed the package restore settings above, you’ll want to run “npm install” inside each project after cloning. The ‘Empty’ solution assumes the webpack-dev-server for hosting, so when you run ‘npm start’, webpack will host a simple webserver at the port listed in webpack.config.js. The ‘MVC’ solution assumes it will be hosted by IIS Express or the built in webserver. The ‘npm start’ command on this application will actively watch for JS file changes and rebundle them for you. No need to recompile to see your changes unless you something managed by .net. This approach does leverage Babel as the transpiler. If you would like to use TypeScript, you could do that as well. The webpack configuration assumes that the application start/root is /ClientApp/index.js. 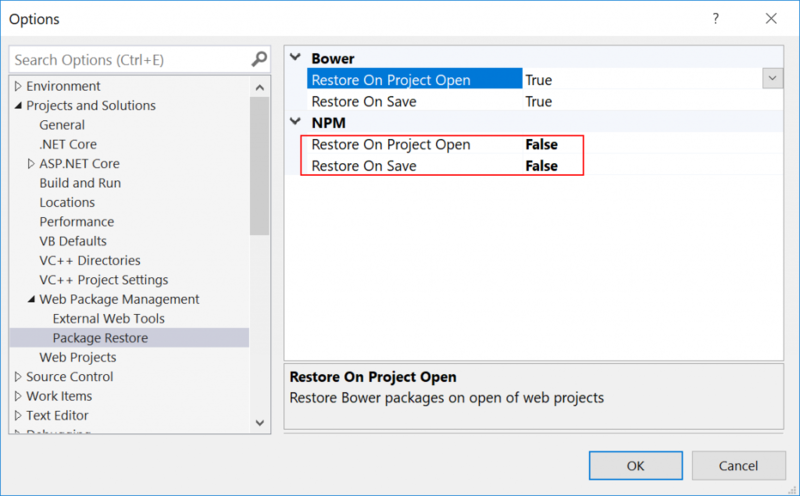 The webpack configuration also assumes that everything is written to the /wwwroot/ folder as is convention with ASP.net Core projects in Visual Studio 2017. I hope you find this post useful. It took me a bit of searching to figure some of this out since most tutorials focus on Visual Studio Code. Feel free to reach me on twitter if you have questions about any of this. Happy programming. Here is a common scenario for you. You’re building an application… any application. It could be your side project, a sales tool, an ecommerce site, a REST api, a video game, a reporting dashboard. Anything. You’re building your app, and you reach a point that you’d like to try it out, to see how it would look to a user. How do you simulate a production scenario with no data to test with? If you’re lucky, you have data from an existing customer you can use, or there is a sample dataset available online. If you’re unlucky, you’re left generating dummy data using garbage inputs (random strings, random numbers, etc) – data that passes the regex, but doesn’t provide a good simulation. Do you wish there was a library that allowed you to programatically generate test data? Enter Faker.js. Faker.js allows you to generate a variety of data types in an intelligent and structured way. You can generate: Addresses, Products (Ecommerce), Companies, Dates, Images, URLs, and random objects as well (numbers, strings, words, uuid, etc). Click here to see a demo. If you’d like to consume data from faker in another programming language, such as c#, you could use their hosted microservice at http://faker.hook.io (i.e. http://faker.hook.io?property=name.findName&locale=de). A second option would be Bogus, a port of Faker for .net. There are ports available for other languages as well and the API surface is roughly the same in each instance. I setup a very simple Github repo that demonstrates how to use Faker in a variety of scenarios to help you accomplish your goals. Hopefully you find this utility as useful as I do for prototyping new functionality before it goes into production. Just like hammers, drills, and screwdrivers are the tools of the modern tradesman, so to is the computer the trade tool of the modern software engineer. How it is constructed and how well it performs determines how well you can accomplish the tasks you set out to complete. With this notion in mind, it was time for me to sell my 2014 MacBook Pro 15. It was a great machine from a performance standpoint. It had a wonderful display, fantastic keyboard to type on for long sessions, and a trackpad that could beat any others in the year I bought it. So why sell the laptop? Well, frankly, because it’s hard to be a .NET developer on MacOS. Sure, there are great IDEs like Visual Studio Code, but that pales in comparison to the feature offering of a full fledged Visual Studio IDE when working with a large solution compromised of multiple projects. What about Visual Studio for Mac you ask? Also wonderful if you’re primarily working on Xamarin apps. They’ve made fantastic strides with it, but support is behind for several features not directly benefiting Xamarin, such as TypeScript. Honestly, I don’t mind the idea using a cloud Mac provider like Macincloud.com to handle my Xamarin builds remotely as there is nice support for this now. The final nail in the coffin is Parallels. Yes, it works, but it’s expensive (including recurring fees), it’s clunky, and it’s not nearly as performant as a native OS. Throw in applications like Docker and you have strange Inception level virtualization issues to wrestle with. So, where does that leave us? In the past, this may have been difficult to swallow, because one reason so many developers love their Macbook is because it runs a variation of unix, and subsequently has great capabilities beyond the wonderful UI it offers. A .NET developer looking to verify their apps run cross-platform could have considered this, but thankfully, today we have Linux subsystem for Windows. I just installed Ubuntu… from the Microsoft Store… crazy! 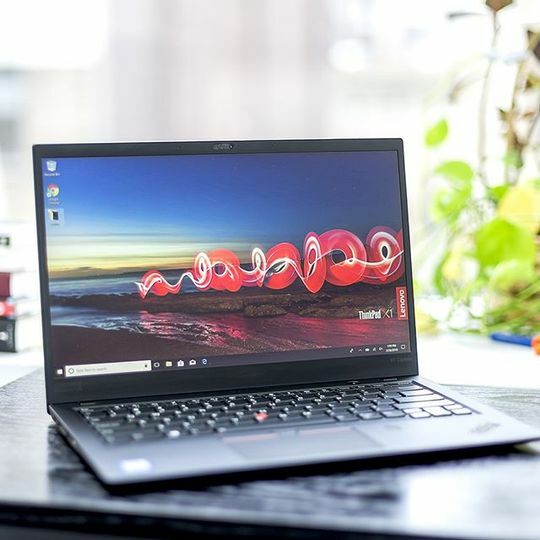 Ultimately, after a lot of research, I settled on the Lenovo X1 Carbon (5th Gen). It is a fantastic laptop, and “everything works” despite my belief that was only possible on a Mac. I went with the 16GB model, 512GB of storage, and the WQHD display. It’s got great battery life (I spent about 5 or 6 hours on it with pretty heavy load tweaking settings, installing all my applications, and it lasted on battery only no problem). Some additional features of the laptop I plan to leverage but haven’t yet, are the fact this unit has 4 PCIe lanes, so an external GPU such as the Gigabyte Aorus GTX 1070 will allow me in the future to have the dream setup: one single machine for both work and play. I looked at other models like the Dell XPS 15 but this had some shortcomings like the webcam position (I do video calls for work sometimes) and also I didn’t want the 4K display to avoid some high dpi compatibility issues and battery drain. Another positive, on modern laptops in general, is the fact that USB-C charging is nearly ubiquitous and getting my laptop charged is now less of a concern than before with the proprietary Macbook charging adapter. Also, if I ever decide to convert this into a Linux laptop, it’s good to know that this model has good support already for it and all of the hardware should be compatible for me. It will allow the laptop to last quite a long time if necessary. All in all, I’m really, really happy with this laptop. And the best part about it: Windows has come a long way and is actually pretty nice to use. More applications run on it, it has the Linux subsystem support, and it’s improving constantly with the “Creator” updates they are releasing. Hey everyone – I’ve been maintaining a list of little shortcuts to save me time and ease my development efforts and figured they would be worth sharing here. If you have any you would like to share here, please email me and I’ll include them as well. Ctrl+. opens up the ‘Smart Tag’. Use it when you see the red squiggle line to add a missing reference, or implement an interface. Ctrl+K,C will comment either the current line, or any block of code you have highlighted. Ctrl+K,U will uncomment either the current line, or any block of code you have highlighted. 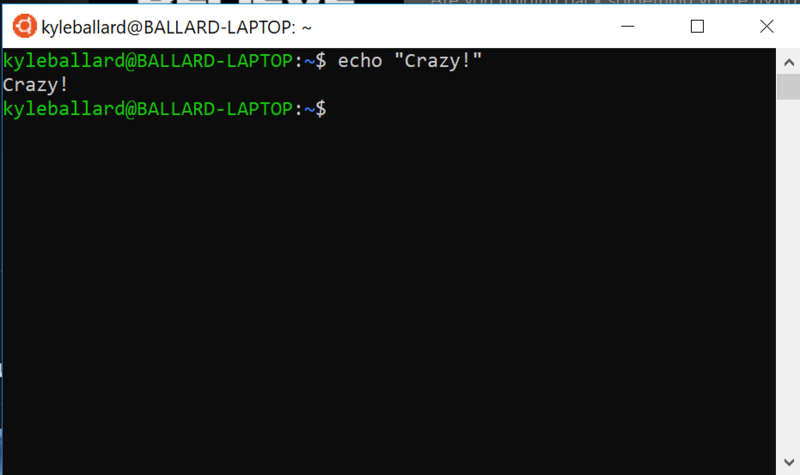 Ctrl+, opens smart search to quickly find and jump to a class or method name. Shift+Alt+Enter for enter and leave full screen mode. Custom snippets, click here for a starter list and how-to. Right-click file in Solution Explorer, select Source Control > Annotate. This shows all history of the file and who checked in what line of code. Tell debugger to ‘break’ when an exception is thrown even if no breakpoint exists (Ctrl+Alt+E, then check Thrown on CLR). Annotated below is a presentation from Nik Molnar, co-founder of the open source debugging and diagnostics tool Glimpse, who demonstrates several different strategies for improving the performance of your web application. This is easily one of the most useful conference presentations I have ever seen and I wanted to share it with everyone. If were curious about how to do any of the following tasks, this presentation will cover those for you. Next to each point is a bookmark for you to jump to that portion of the presentation. The number of technologies in development, that are real and not science fiction, is astounding. These are technological advances are that are just over the horizon and are simply a matter of time to come to market at a reasonable cost for all of us. Do you remember what life was like before GPS, cell phones, personal computers, the internet? Sure, life was good, and we all got by just fine, but these advances all make life so much more enjoyable and interactive for all of us lucky enough to inhabit it. It’s a great time to be alive as a technology enthusiast. The future is bright, and I’m glad to be a part of it. Do you have events in your application that you would like to trigger a notification to other users? How about if a user places an order on a website and you want the website administrator to see a notification, or a sale on Apple products is initiated and you want to notify customers? Note: If you wish to download the code to follow along instead of going step by step, you may download it on Github here. Let’s walk through the steps, it’s not too difficult. 1. Create a new MVC project in your favorite language, I’ll be using C#. I disable user authentication and name it ‘SignalrToastr’ but you can name it whatever you would like. 2. Open ‘package manager console’ for your application, and install the SignalR package. 3. Create a class file named ‘Startup.cs’ and place it in the root of your application. Give the following contents to your new file. This file is an Owin startup file, which is outside the scope of this discussion, but is worth noting as Owin will become a larger part of ASP.NET vNext. It is a middleware framework that resides outside of IIS. Microsoft also uses Owin for the ‘Individual Accounts’ user manager, so if you left user authentication enabled in step #1, you can simply add the ‘MapSignalR’ line below to the Startup.cs class it created for you. 4. Create a folder called ‘Hubs’ and add a file named ‘ContactHub.cs’. Enter the following contents into the file. // Calls the 'notifyUsers' method on the client side. //  Note:  You can change 'All' to target only certain clients. //  Note:  Code after 'All' is dynamic, and you can specify whatever name you wish. SignalR uses ‘Hub’ objects to communicate between the client and the server. We will go over more on what is actually happening here in a later step. For now, you should note that ‘ContactFormSubmitted’ is a method being called on the server, from the client. The client passes this server method two parameters, name and message. This server side method then notifies ‘All’ clients to execute a JS method named ‘notifyUsers’ which takes one parameter, name. Outside the scope of this tutorial is how you can narrow down which clients you want to send the message to. // Callbacks to the client should be defined here. // Calls to server should be included within the hub.start() method. // Call the ContactFormSubmitted method on the hub. // Clear text boxes and reset focus for next comment. return false;  // prevent 'form' from submitting. This creates a simple two field bootstrap form, and also adds our required JS includes to make SignalR work (jquery.signalR-*, and ~/signalr/hubs). It also creates a placeholder for our client callback notifyUsers, and also adds an event handler for our contactFormSubmitted method to push to the server. If you build your solution at this point and open your browser to your projects location for /signalr/hubs/ (i.e. http://localhost:62279/signalr/hubs/) you’ll see some generated JS markup that SignalR created based on your hub. Note how it lower cases your hub name, and methods. This is what the SignalR framework is creating for you automatically based on your Hub classes. 6. Repeat step #2, but install the Toastr framework. 8. Modify your scripts section of Contact.cshtml to look as follows. Note how we have added a reference to taostr.js and also placed the toastr.info call inside our notifyUsers callback method. 9. You are done at this point, so let’s try it out. Open two different browsers side-by-side, I’ll be using Chrome and Firefox. This is done to show you how the server is making a callback to ‘All’ clients as shown in step #4. You can narrow this down in the future if you want, to only administrative users for example. If all goes well, you should be able to fill the form out in one browser, and see the popup in both.